You can't go wrong with a good pair of girls rain boots. There seems to be something about rain puddles that fuels kids with an irresistable urge to jump in them! With the right rain boots, however, your favorite little girl can splash around to her heart's content. Rain boots have only been around for around 200 years. They were made popular by one Lord Wellington in the early 1800's. Lord Wellington had his tall Hessian boots--that were all the rage for men at the time--adapted so that they were tighter with fewer trimmings. The boots were called Wellingtons, a name they still bear to this day. It wasn't until a few decades later, in the 1850s, that the first pair of Wellingtons made from rubber were created. These boots were a hit with people who were tired of walking around with wet feet after a rain; particularly farmers who spent long days in soggy fields. What should you expect from this type of boot? Most rain boots are made from rubber or modern man-made materials like Goretex, which help to keep water out of the boot and feet dry. Some boots have a cotton lining to soak up water that might make it into the boot. Many rain boots include a tab a the back of the boot to help the wearer pull it on, while others employ handles on each side of the boot. Many boots have a tread on the sole to keep girls from sliding and falling on slippery wet surfaces. There was a time when girls rain boots came in just one or two colors but those days are gone. For years, rain boots were functional and manufacturers gave little thought to their appearance. Luckily, today's girls can choose from all sorts of fun, pretty or wild and crazy designs to express their personalities. 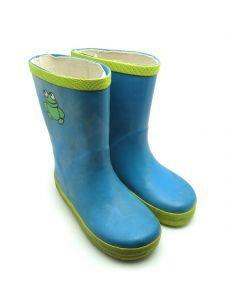 Girls who adore their Crocs shoes might go crazy over a pair of Crocs rain boots. Does she like ladybugs? Then a pair of bright red ladybug boots might be just the thing. From polka dots to leopards, flowers to owls there's bound to be a rain boot that suits your favorite girl. Zappos.com - This site boasts several pages of colorful rain boots. Yellow-Turtle.com - Find a variety of rain boots at this site, including the fun Kidorable brand of boots. Target.com - This site also offers several attractive rain boot styles for girls. Why stop at eye-catching rain boots? For a girl who really likes to stand out from the crowd, look for coordinating rain gear to complement the boots. Some companies make matching raincoats, umbrellas and even rain hats. Alternatively, keep the rest of the girl's rain gear simple so that her unique boots will stand out more.